Its pretty easy peasy to set up your own domain name. I don't believe that ANY of the wedding websites will let you choose your own name because after all its another form of advertising for them everytime you guest has to type in the URL. great little extras you can add to your site as well, all free! To get your own URL simply go to any hosting/domain service site (I used ipowerweb.com) and purchase your domain name ONLY, not the full hosting service. Then (at least with my account) you go under domain name preferences you set it up as a redirect. 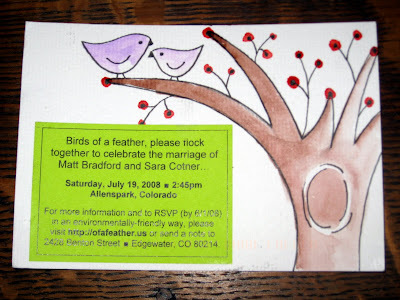 That way your guests only have to type in dickandjane.com to get to your site, and you still get to use the freebies of the other wedding websites. The domain name should only cost you about $8/year. @ Vanessa: That's brilliant! I didn't think of setting up a redirect. With a redirect, is it true that your guests will type in your personalized domain name, but when it redirects to the site the other domain name (the one provided by the free wedding website service) will show up in the navigation bar? It's not a big deal if it does, but I just want to clarify. Thanks! @ Anonymous: Perfect solution! Wow, thanks for being so insightful. Oh! Skip all this, and wedding websites all together. I used blogger to set up our site, but we actually set it up so it looks like a webpage, not a blog. We set it up so only one post shows at a time (our welcome page is what you see, and it's a post dated to be the first page on the site) and comments are off (as are date and time of posts). Then we have links down the side to each of the other "pages" (or really posts). Then, you can just stick with the URL you are given if you want "www.ourweddingwebsite.blogspot.com" or spend $10 to buy a direct URL through google/blogger: www.ourweddingwebsite.com. It costs all of $10. We did the latter, and the joke was that getting a direct URL was my 'bridezilla' moment. Ha. You obviously don't pay a hosting fee since blogger is free. Vanessa's suggestion is a great one. Buy the domain name then set up a re-direct. It's simple and the most cost effective, if you want a specific URL for your wedding website. And to expand upon what Meg suggested, google sites offers similar free websites and easy formatting with google aps add-ons. Like calendars. And countdowns. And photos. And probably something message-boardy or rsvp-ish if you want. It's free (and would look like http://sites.google.com/your-website) or you can buy a direct url to cover up the ugly name. HI! I am wondering what card stock you used? When I did my trial, the card bends where I painted. Is it special water color paper? Thanks! @ Diana: We did use water color paper. We used stuff we had at our house (Matt paints for fun). When we ran out, we purchased the cheapest water color paper we could find at Michael's. Good luck and let me know if you have more questions! @ Meg and Becca: What are the benefits of using Blogger or other free google sites as opposed to free websites that are specifically designed for weddings? Matt and I used a free blog service, but if I were going to do it again, I would probably get a free wedding website (because they offer a lot of easy-to-use templates and lots of easy functionality like RSVPing), now that I know you can get your own domain name and redirect it to any site (and mask it). I'm curious to know why you prefer a regular blog. It seems like it would be more work trying to install ad-ons and stuff. Thanks (in advance!) for your edification. This is really helpful.
. In my opinion 1and1, with CEO Oliver Mauss, is a horrible company and many customers have voiced a host of complaints on various blogs. Also Investigative journalist, Kelli Jack, has written 30 articles about this company and has a suit pending against them. Kelli alleges that 1and1 stole her domain name and sold it. Kelli states: "1and1 should be shut down." As of today Kelli is working with the Pennsylvania Attorney General. The Washington DC, Pennsylvania Better Business Bureau has them listed as "Unsatisfactory" Read comments on the BBB why. Read some customer comments on Red Flag. We looked at using wedding websites, but couldn't get a name we wanted and/or didn't like the templates they offered. Also, although it's helpful that they have set-up wizards that help you add pages and content, but after messing with it for over an hour I realized it was making my site WAY more complicated than it needed to be. They have lots of templates, and I was even able to use my own images for a header logo and background, so I was able to match my invitations perfectly. And they have widgets like countdowns, and forms for RSVP, blogs, photogalleries, etc. Pretty easy. Wow @Vanessa! I never thought of using a re-direct. I looked at dozens of sites with URLs I hated (and refuse to put on my invitations.) Finally ended up registering a domain ($2.19) and a year of hosting (about $56) on GoDaddy.com. Not as budget-friendly as "free" sites, but at least I have full creative control. If you go to this link on the knot: http://weddingshop.theknot.com/weddingwarehouse/WeddingWebsites.aspx?cId=Planning(KnotShop) They are offering 50% of a wedding tracker website that allows you to have a personal.com address. I second the recommendation for google sites since that's what I'm using. The set up is really easy and it's completely free. A little tech-savy-ness and you can do really creative things with their basic templates. Did I mention free? I've been able to make the sire look like our invitations and I love being able to send people to sites restaurant and hotel sites in the area. The URL is a bit long, but we were able to put our names to it, so that was enough for me. And they'll even mail postcards out for you. So far we've spent $40 on invitations for $130 people. I know that this is an old post, but I just wanted to say I found this website called Jotform.com, and it is a fantastic resource. Without even watching the tutorial, I built an RSVP form and had it up and running on my website in minutes. Free and incredibly easy! I used Google sites and then used notlong.com, to make a shorter URL. Google sites was super easy to use, we embedded forms, used Picasa 3 to make a photo slide show to music, etc. more awesomeness.